So, the witch gathered up her heavy apron and began to hop from hill to hill… and the stones began to fall out of her apron. She didn’t even notice the pile of stones she left on top of the first hill… and she thought her apron felt a little lighter on the second hill… but she kept hopping until she got to the fourth and last hill. She looked down and saw that there were just three stones left in her apron. And St. Patrick smiled, for he knew the witch had to leave Ireland forever. At least that’s the story that generations of Irish children heard about the gleaming white stones on top of each hill near Oldcastle. But in the 1800’s a local teacher described and catalogued the prehistoric passage tombs and excavation of the Loughcrew Cairns began. As it turns out, the mounded tomb site significantly predates St. Patrick and the witch. In fact, it dates back to 3000 BC and is older than the pyramids in Egypt. Known as cairns or passage tombs, the structures at Loughcrew were chambers, some of which contained cremated human remains, and they are sited so that on certain days of the year the inner chambers are filled with light at sunrise. The white quartz which once covered the cairns has been carted away, but there are still dramatic examples of tomb art carved into the interior stones. 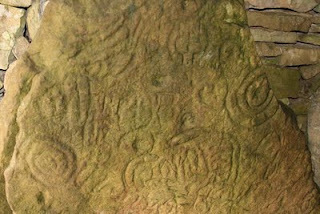 Archaeologists suspect that the geometrical carvings operated as calendars and star charts for their prehistoric creators. Who will love it? This is a great outing for children and anyone who is active. However, there is no accessibility for those who are handicapped. Arrangements: the road up to Loughcrew is steep and in many places is only one lane, so be careful and drive slowly. If you are visiting during the off season and aren’t much of a DIY traveler, you can contact Malachy Hand (malachyhand@hotmail.com or +353 (0)87 96 72435). Malachy is a local guide who works for the OPW during the tourist season. In the off-season, though, he gives private tours of Fore Abbey, the Kells Heritage Center, and the northern parts of Co. Meath, including Loughcrew. 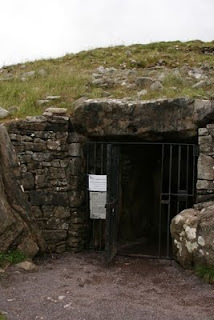 Notes: there are no toilets or facilities of any kind at Loughcrew. In fact, to get to the top of the hill, you have to climb through a sheep pasture. So, wear walking shoes. Take a jacket. A hiking stick might be a good idea. And don’t be afraid to get a little muddy. The rewards at the top are worth the exertion! And take a flashlight. 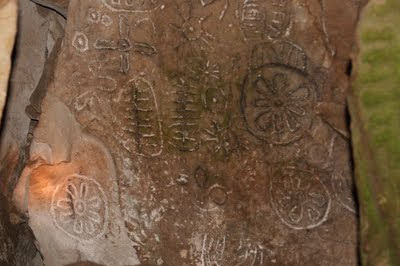 It is much easier to see the carvings on the stones with a little illumination. While Newgrange and Knowth are better-known examples of megalithic tombs, their World Heritage Site status has also insured that they are always busy. In fact, unless you arrive before 9 am, it can be very difficult to get in at all. Not so at Loughcrew. And there’s no admission charge, either. 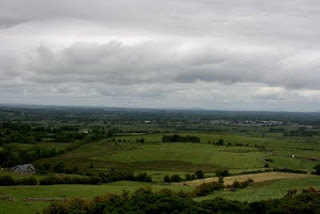 From the top of the hill there are 360º views of Co. Meath with green fields and charming towns in each direction. Only one of the witch’s hills, now known as Carnbane East, is accessible. Surrounded by a small fence, the summit contains several ancient tombs in various states of disrepair as well as the Witch’s Throne – what was probably a sacrificial altar. Cairn T, at the center, is the best preserved and contains some spectacular carvings. On the vernal and autumnal equinoxes shafts of light from the rising sun illuminate the stones at the back of the tomb tracing a pattern of light across the carved stone. For 5000 years human beings have been climbing the hills in Co. Meath – honoring the dead, celebrating the living, and wondering about their place in the universe. And for 5000 years people have been telling stories – like the story of St. Patrick and the witch – giving meaning to those sacred places. A visit to the cairns at Loughcrew is an entrance into the stories of generations upon generations, and you’ll probably go home with a few stories to tell yourself. Before you drive up to the top, stop at Loughcrew Gardens (http://www.loughcrew.com/). Their charming coffee shop has clean bathrooms and great coffee. At the counter, ask if anyone is up at Loughcrew. During the summer guides from the OPW are at the top to give tours and information. However, during the off-season visitors can visit independently after getting the key to the site from the coffee shop. Yes, that’s right. You just stop in at the coffee shop and get the key to the 5000 year-old tombs and go to check them out your self. The women at the coffee shop will give you driving instructions or you can just follow the signs, but watch carefully. The car park/wide-spot-in-the-road is unmarked as is the stairway to the path up the hill. Ignore your instincts that will tell you you’re in the wrong place and look for the metal barrier at the base of a steep stone staircase. It’s the X that marks the spot. 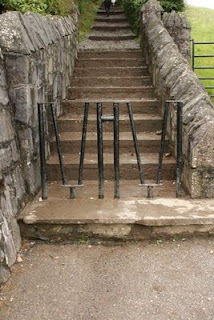 Climb the stairs and then follow the small wooden markers up the hill to the gate. After our hike up to Loughcrew, we enjoyed a lovely lunch at the Loughcrew Garden Coffee Shop (the same place where you can pick up the key). Our meal was delicious – soup, brown bread, a toasted sandwich – and the prices were reasonable. REALLy cool, angela! we'll have to head there soon. thanks!